Sports Commentator Clinton Grybas has died, aged 32. Gribas covered sports for FOX Footy and Radio 3AW. He was found in his apartment this morning after failing to return to work, was rushed to hospital, but was declared dead. Clinton began with the ABC in September 1995 at the completion of a public relations/journalism degree at RMIT. 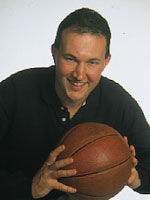 He broadcast his first AFL season in 1996 at the age of 21. He joined ABC radio in Melbourne, broadcasting AFL for ABC radio and television, plus including anchoring events such as the NBL and WNBL, Hopman Cup, Stawell Gift, Coolum Classic, Austral Wheelrace, international lawn bowls events and the National Soccer League. In 1998 he was a member of ABC Radio’s Commonwealth Games team in Kuala Lumpur, broadcasting diving, cricket and ten-pin bowling as well as providing interviews from the team village. Grybas joined 3AW in 2001 where he covered the Australian Open, F1 Grand Prix and AFL. Manager Graham Mott said, “He’s just one of those genuinely brilliant people who is very good at what he did and a terrific bloke as well. “At a time like this, while you can think about the wonderful things he did it’s still hard to get over the fact he’s gone, no longer with us. “We wish his family and friends the best at a most difficult time for everybody,” Mott said. With FOX Sports, Grybas commentated the Sunday Twilight match with Gerard Healy and Glen Jakovich. UPDATED: The sports world is in shock following the apparent sleepwalking death of young gun footy caller Clinton Grybas. Friends and family of the 32-year-old found dead in his city apartment today said they understood he had died after hitting his head while sleepwalking. They recounted incidents where the 3AW and Fox Sports figure had frightened himself by waking on his 15th floor balcony. In another sleepwalking incident, Grybas thought an intruder had given him a headwound after hitting his head. UPDATED: The service will now be held to the CityLife Church in Wantirna South on Tuesday Jan 15 at 11am. The church at the corner of High St Rd and Cathies Lane (Mel Ref 72 D2) seats 1850 people. One sad event that many people will remember exactly where they were and what they were doing when his death was announced – such as the deaths of President Kennedy and Princess Diana and the tragic 9/11 losses. We felt like we knew you and we will miss you – such a likeable man. Our sincere sadness to his family, partner and friends. We have lost the only man to ever surpass Bruce Mcavaney. His perfection in facts was definitely second to none. Obviously held with high esteem by his co-commentators (most of which were his senior by 15+ years) and with good reason. IT will take some time to get over not seeing host AFL shows. Unfortunately we’ll probably have Anthony Hudson forced back on us and he’s a far cry short of the talent of Clinton. Clinton, I hope you have gone on to bigger and better things, as that is what you were destined for on earth. Commiserations to the Grybas family as we hope in time that the pain will ease. All anon said was the primetime news never reported the cause, when clearly the radio did long before. That is a discrepancy. I guess free speech in this country is truly gone, with or without Howard in charge. An absolute tragedy. His enthusiasm, professionalism and knowledge will be extremely missed amongst his peers and the public. Anon could show a little more compassion instead of worrying about the cause. Condolences to the family and friends. THE death of Melbourne sports commentator Clinton Grybas is being investigated by Victoria police – but it is believed he died while sleepwalking. Friends and family of the 32-year-old found dead in his city apartment yesterday said they understood he had died after hitting his head while sleepwalking. Clinton, you will be missed. You were a true favourite of mine. I loved watching you on White Line Fever. Some news reports are suggesting it could be sleepwalk related – perhaps a fall… apparently he had a history of such. Anon, at this time let’s respect family privacy and await due process. He was my favourite footy commentator. Informed, balanced, a true professional who obviously loved his job with a passion… a true beacon in an industry otherwise littered with ego-driven, lazy and self-centred ‘celebrities’. No news show is saying whether is was natural death or self inflicted. The media Industry has lost a true professional in Clinton. He was an excellent all rounder nothing would ever faze him, he was born for the job and not a hint of arrogance. R.I.P mate will miss you dearly.